I have long advocated the use of PDF documents but have recently been asked to justify my preference for them over Word documents by someone who thinks Word documents are more accessible. For sure Word is now far more accessible than it used to be and certainly you do see badly designed and inaccessible PDFs, as you do Word documents. However, all things being equal I still think PDFs are preferable and what follows is my justification for this view. I’m putting it ‘out there’ in the hope that others will be able to correct me if necessary or join the debate. The arguments for not using PDFs are normally based on ignorance. For example, people say you cannot change the colour of the text in a PDF and that students cannot edit them. This article shows you how to do all those things in PDFs that you thought you couldn’t do and ex-plains why PDFs are generally more accessible. Firstly it has to be understood that whether you use PDFs or Word documents, they will be opened in a particular program, which may or not be the program you used to create them. So, for example, the fact that you create a Word document and put a link to it on your Moodle page does not mean that the viewer will view it in Microsoft Word. This is because each file has a file extension which the computer’s operating system associates with a program. 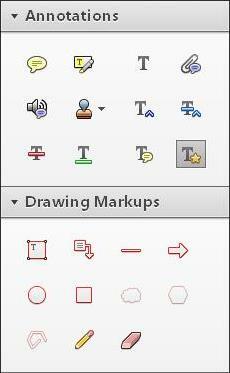 If you are using a Windows PC, you can find and change file associations in the Control Panel. Press the Windows Start button, click on Control Panel and then choose Default Programs. If you use Internet Explorer as your browser, you can also get to the same place if you go to Options where you will see a tab called Programs. You can then go to this section in the Control Panel. When you install a program that is capable of opening certain files it often asks you whether you want to make this program the default program for opening certain files, so there are all sorts of programs, with which we are not familiar, which may be being used by students because they have installed software which makes itself the default program. 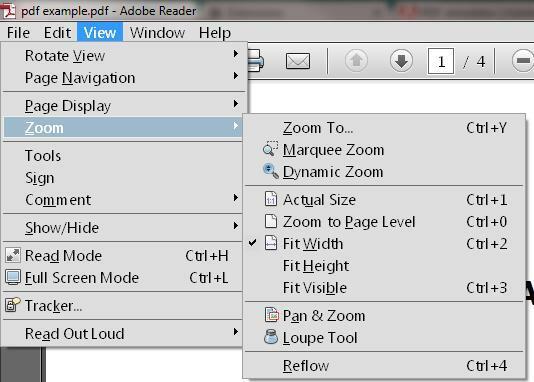 So the question is not, ‘how do I change the font or background colour in a PDF?’ but rather, ‘how do I change it in the program I use to open a PDF?’ And similarly, not how do I set a different background colour in Word but how do I do that in the program I use to look at Word documents. One good thing about Adobe Reader is that it is free and it works on all operating systems and devices. Therefore, we can encourage all students to use it and can assume they all have it. This makes it easier to support students than if they are all using different programs. It also means we do not have to keep double checking that what we produce in Word can be accessed satisfactorily by all our students. In terms of enhanced accessibility students often want to adjust the following elements in a word processed document. Adobe Reader XI (which, at the time of writing in November 2014, is the latest free version) can do all these things. This can be done from the View menu. This is much more sophisticated than simply zooming in and out, as can be seen by the menu below. I won’t go into all the options but as can be seen , increasing the size of the text is not an issue. If the student is concerned about the size of the text when printed out, we will deal with that later. Changing the colours of text and background. On the Edit menu there is an Accessibility option. This allows the student to overwrite the authors’ colours and choose high contrast colour combinations and it also allows the changing of colours in form fields. The Accessibility Assistant allows the student to deal with all accessibility options in one place and the Preferences facilities allows defaults to be set so that all documents are displayed similarly. If the document was created with heading styles to provide it with a structure then Reader displays the headings as bookmarks and the student can see the overall structure at a glance and can expand and contract sections at will. This is all available in the freely available, free of charge version of Adobe Reader. All the same issues of accessibility that relate to Word documents also apply to PowerPoints and they probably affect more students than are inconvenienced by Word documents. Again, the solution is to save the PowerPoint as a PDF. It won’t stop it working, it will simply ensure it works on everyone’s computer or mobile device. One misconception about PDFs is that they cannot be edited. Some people see this as the main advantage and the reason for choosing this format over Word. However, PDFs can be edited and you can save a Word document so that it cannot be edited. The ability to edit a document is determined by whether you have an editing program and whether the file was protected against editing when it was saved. However, let us assume that our students have a protected PDF. What sort of editing might they want to do? If they want to add notes, underlines, highlighting, audio notes, arrows or shapes – the typical things students might want to do – they can do all this in Reader. If they want to copy the text and paste it into a file they are working on in a Word Processor, they can simply copy and paste. No problem. If they want to save it as a text file, this is also available from the File menu. Some people argue that you cannot select text in PDFs. This is another misconception because they have seen an image file saved as a PDF (probably made by someone making a scan and not thinking to save it as text). PDFs can contain all sorts of things – images, text, sounds, video (as can Word documents). If we want students to be able to use text-based PDF documents efficiently we need to save them as text and not as images. So the student can either annotate within Reader or copy and paste the text into their Word Processor, which may or may not be Microsoft Word. Some students may want to print the document with larger text than the font size the author chose. The best solution is to increase the scale of the document and to print it on larger paper. This is the best solution since it retains the layout of the original document, whereas if you edit the document and increase the font size without increasing the paper size you will alter the layout. Obviously you need a printer with an A3 paper tray but we have these on campus and in Adobe Reader you can scale up the document from the Print menu. (Remember that if 100% is A4, 200% is not A3 but A2. You can use the preview pane to check things are as they should be before you print). If the student does not want to scale up the document then they may want to edit the document and increase the file size. As mentioned already, this alters the formatting and consequently the page numbering. Editing has already been dealt with. So how do we make PDFs. One solution is to use Adobe Acrobat, however, our staff are supplied with Microsoft Office and are more familiar with this program, so the simple solution is to create Word documents and PowerPoint presentations in the normal way, ensure they are properly accessible, and then save as PDFs. And now we have come back again to programs and we can see that not only do we not have to use the program that created the file to read it, we don’t have to create the file in the program that we expect it to be read in. Many tutors think that because they supply Word documents and PowerPoint presentations to students and receive back from students Word documents and PowerPoint presentations that their students are using Microsoft Office, but this does not necessarily follow. Just as you can create a document in Word and save as a PDF, you can create a document in most word processors and save it as a ‘Word’ file (a file with a .docx extension), which will open on your computer in… well, who knows? I have probably given the impression that PDFs are always read with Adobe Reader or the browser but this is not the case either. There are many good programs available which students might be using (e.g. Foxit Reader) and many apps available for phones and tablets, but I think we can legitimately assume that if we provide PDFs they can be read by anyone anywhere whereas if we provide Office documents they may not so easily be accessed. See http://www.jisctechdis.ac.uk/techdis/resources/accessdocpres too for further information.